Vesak is the most sacred holy day of Theravada Buddhism. Also called Visakha Puja or Wesak, Vesak is an observation of the birth, enlightenment, and death (parinirvana) of the historical Buddha. Visakha is the name of the fourth month of the Indian lunar calendar, and "puja" means "religious service." So, "Visakha Puja" can be translated "the religious service for the month of Visakha." Vesak is held on the first full moon day of Vesakha. There are diverse lunar calendars in Asia that number the months differently, but the month during which Vesak is observed usually coincides with May. Most Mahayana Buddhists observe these three events of the Buddha's life at three different times of the year, however, the Mahayana celebration of the Buddha's Birthday usually coincides with Vesak. In Japan, Buddha's Birthday is observed every year on April 8 in the Gregorian calendar instead of a lunar calendar. The Tibetan Buddhist equivalent of Vesak is called Saga Dawa Duchen and usually (although not always) falls a month later, in June. For Theravada Buddhists, Vesak is a major holy day to be marked by a rededication to the dharma and the Eightfold Path. Monks and nuns meditate and chant the ancient rules of their orders. 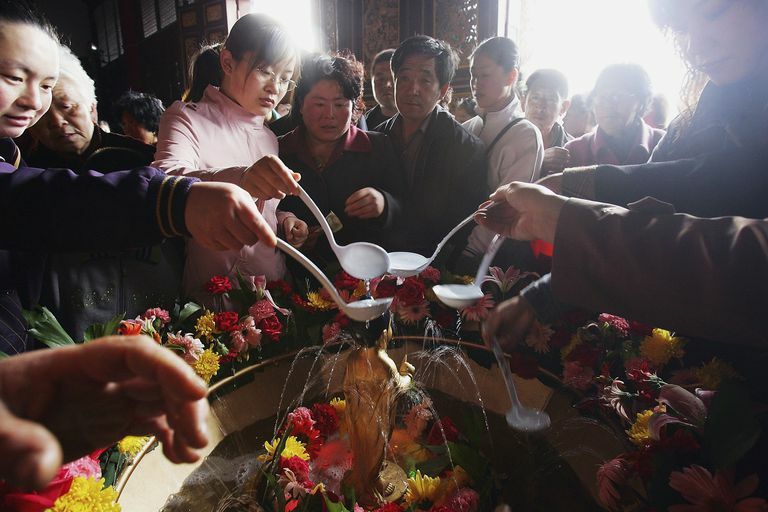 Laypeople bring flowers and offerings to the temples, where they may also meditate and listen to talks. In the evenings, there are often solemn candlelight processions. Vesak observances sometimes include the release of birds, insects, and caged wild animals to symbolize the liberation of enlightenment. In some places, the religious observances are also accompanied by impressive secular celebrations of parties, parades, and festivals. Temples and city streets may be decorated with countless lanterns. According to Buddhist legend, when the Buddha was born he stood straight, took seven steps, and declared "I alone am the World-Honored One." And he pointed up with one hand and down with the other, to indicate he would unite heaven and earth. The seven steps represent seven directions -- north, south, east, west, up, down, and here. The ritual of "washing the baby Buddha" commemorates this moment. This is the single most common ritual, seen throughout Asia and in many different schools. A small standing figure of the baby Buddha, with the right hand pointing up and the left hand pointing down, is placed on an elevated stand within a basin on an altar. People approach the altar reverently, fill a ladle with water or tea, and pour it over the figure to "wash" the baby.